Five neighborhoods impacted by Rockaway rezoning. Rockaway Rezoning Locator used with permission of the New York City Department of City Planning. All rights reserved. Rockaway residents clash over plan for Beach 116th Street. After almost three years in development, the rezoning proposal for the Rockaway peninsula in Queens reached the City Planning Commission for a hearing on June 18, 2008. 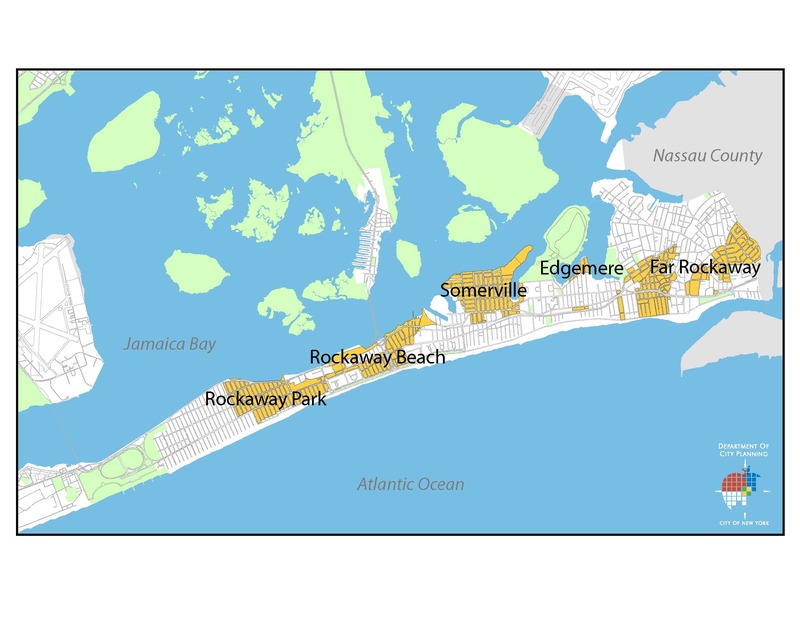 The plan entails a contextual rezoning of 280 blocks and impacts five neighborhoods: Rockaway Park, Rockaway Beach, Somerville, Edgemere, and Far Rockaway. The bulk of the rezoning, 245 blocks, would replace the existing zoning (R3, R4, R5, R6) with contextual zoning districts, including R3A, R4A, and R5A, which the Department of City Planning believes will go further in protecting these neighborhoods from inconsistent development. Integral to the rezoning is the proposed up-zoning of certain blocks adjacent to public transit, such as Beach 116th Street, which the City hopes will spur needed reinvestment. Residents clashed over the specific plan for lots along Beach 116th Street, where the plan calls for an upzoning from an R5 to an R7A district. This increase would allow mixed-use buildings with a maximum building height of 80 feet, up from the existing 40-foot limit. Supporter Vincent Castellano, a resident and Queens Community Board 14 member, explained that people oppose the idea of the upzoning until he takes them down to Beach 116th Street. Calling the block a “slum,” Castellano told the Commission that the newest building on the east side of the block was built in 1929 and the area needed revitalization. District Manager Jonathan Gaska reported that Board 14 supported the rezoning by a vote of 35- 12-2, and the twelve in opposition remained concerned with the upupzoning on Beach 116th Street. After residents completed their testimony, Jordan Most, an attorney for Yeshiva Derech Ayson in Far Rockaway, requested that his client’s lots be removed from the rezoning entirely to avoid being down-zoned from an R5 to an R4A zone. Acknowledging that it was “late in the game,” Most claimed that the down-zoning would impinge on the Yeshiva’s development plans. When Most added that he had reached out to the Community Board, Chair Amanda Burden asked him when exactly, adding that the Department undertook three years of community outreach as part of the plan. Most responded that the letter to the Board was still “in the works” since his client had just learned of the rezoning. Burden explained that it was difficult for the Commission to make such a late modification especially in light of the fact that the Yeshiva failed to submit any plans for its consideration. Burden recommended that the Yeshiva schedule a meeting with the Department. The Commission has until August 12 to vote on the proposal. CPC: Rockaway Queens Rezoning (C080371ZMQ – rezoning, N080372ZRQ – text amend., N080373ZRQ – text amend.) (June 18, 2008).